PM will return to Israel only on Thursday despite deteriorating security situation; Netanyahu expected to meet with Merkel, Macron, and May. Despite the deteriorating security situation in the south, the Prime Minister decided to extend his visit in Europe next week. Netanyahu is scheduled to leave for a round of political meetings throughout Europe. He will begin his meetings on Monday in Berlin with Chancellor Angela Merkel. From Berlin, Netanyahu will continue to Paris for a meeting with President Emanuel Macron, and from there to London for a meeting with British Prime Minister Theresa May. 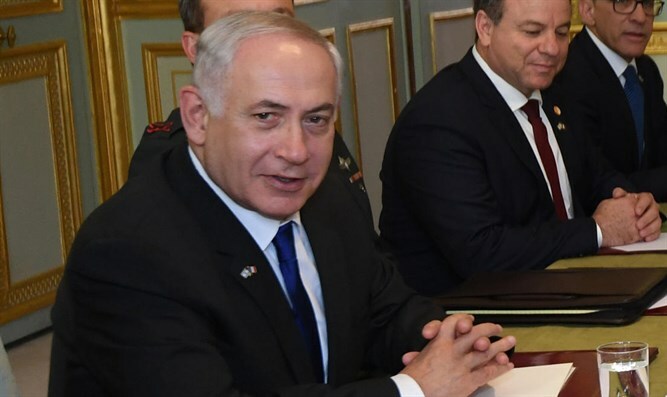 Netanyahu was supposed to return to Israel next Wednesday, but today it was decided to extend the visit and therefore the Prime Minister and his entourage will only return to Israel on Thursday. The meetings were scheduled in advance. In France, Netanyahu is also expected to participate in an event aiming to mark strengthening relations between the two countries.